Looking to Maximize your Home Cooling & Heat Extraction? Heat extraction is easy in principle. During those scorcher summer days, we like to crack open windows and get the fans on high. Or perhaps you’ll close everything up and hope the air conditioning does the job. But it isn’t enough. Next time you have a warm day of 38°C or above, reach up and feel your ceiling. You’ll notice that the ceiling is probably warm, if you haven’t installed insulation or if the ceiling is thin! 25% to 35% of heat in summer radiates directly through your ceiling. A further 25% to 35% of warmth comes directly through your windows, which most people will simply use curtains for. Unfortunately, you can’t really install curtains on your ceiling. Heat will always leak through, and heat can even dissipate through the ceiling in winter! If you’re looking to keep your home at a comfortable temperature throughout the year, you need to consider heat extraction & roof ventilation seriously. We’re going to be looking at 4 ways you can improve your home cooling and heat extraction. These range from simple improvements around the home, to changes in the way you cool your living spaces. Let’s get into it! Thermal or insulated curtains are a great way to block out heat! When you install curtains, make sure they’re insulated! Many kinds of insulated curtains will have some form of foam or material on their outer layer that aids in blocking heat exchange & thermal radiation. These can be pricier than standard blinds, but thermal curtains are worth the returning investment. As we discussed before, 25% to 35% of thermal radiation cuts right through windows. A thermal curtain acts as a barrier to prevent heat exchange. 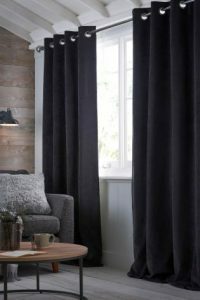 Check out FabAtHome.org for more information on thermal curtains! In naturally hot climates such as far-North Queensland, having external blinds is incredibly helpful. If you can conceal your windows with white or near-white blinds, you’ll reflect most of the heat hitting your home. Remember, white reflects heat! Black will absorb it. These, combined with interior insulated blinds, will cut most of your home cooling problems assuming the fit is adequate. Let’s assume you have insulated or thermal curtains and awnings. Now, you’ll want to make sure the curtains fit or cover most of the window frame. Curtains won’t be much help if there’s room for heat exchange around them. Ensure the fit covers the sides, and top of the frame. Poor-fitting curtains won’t restrict air movement, and you’ll face unwanted heat losses or gains. It’s also worth noting that over-fitted curtains can help block up the window space. 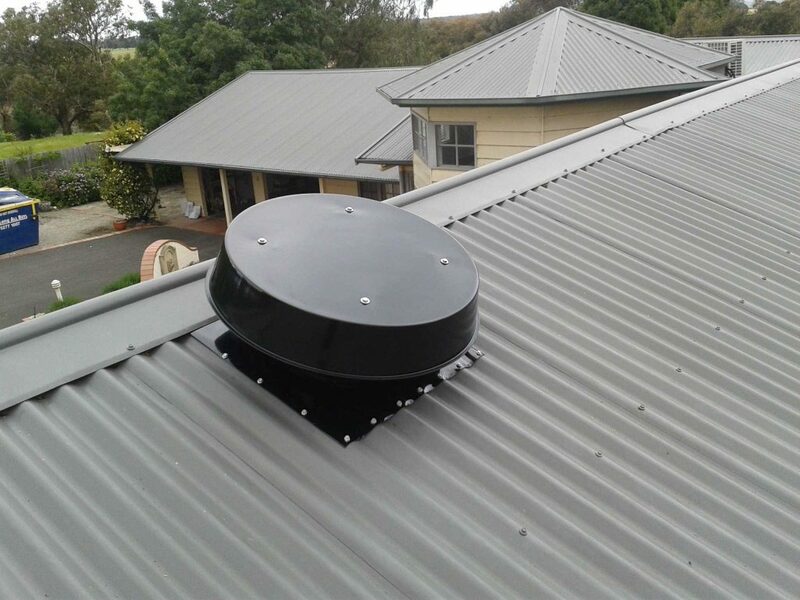 An example of a roof ventilator alternative mounted on a metal roof! Roof ventilation is important for heat extraction. If you can’t move heat out of your roof, it won’t go anywhere. Simply having eave vents or roof vents isn’t enough to cool your roof. We can’t stress this enough! And don’t settle for a whirlybird ventilator, as they only help extract minimal amounts of air. A roof ventilator is perhaps the most crucial step in keeping your home cool. Your air conditioner is going to struggle to keep your house cool if you aren’t actively getting enough air changes in your roof space. The closer your roof is to the ambient temperature outside, the easier it is for your air conditioner to cool. If you don’t have any way for heat to be extracted, your roof can easily exceed 70°C+ degrees. I’m not joking here, either. Climb up into your roof cavity and see how long you last on a summer day! Check out our 2018 Roof Ventilation Alternatives roundup here! Wind-driven ventilators like roof whirlybirds rely purely on wind & thermal expansion to operate. If there’s no wind, they don’t run properly. They begin ventilating when heat expands in your roof space. Obviously, if you’ve let your roof get warm in the first place, that’s bad. Mechanical, active-powered ventilators are generally all electrically operated. These ventilators are the most popular because they can extract huge volumes of air per hour, where wind-driven heat extractors can only pull a small amount. These come in a variety of shapes, but usually are solar or mains-powered. Hybrid ventilators are effectively wind/electrical operated. These fill the space between Wind-driven ventilators and mechanical ventilators. Another example of solar-based heat extraction! 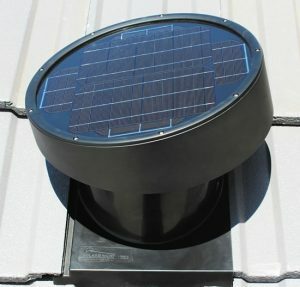 By far, Solar powered heat extraction fans are the superior choice. 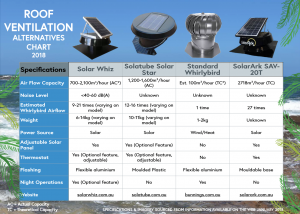 Ventilators come in many shapes and sizes, though we’ve found that solar ventilators such as Solar Whiz, Solatube, and Solar Ark to name a few, provide some of the strongest heat extraction potentials. Every second year, we review an array of residential roof ventilators, some solar-powered, and others running on mains. Check out our 2018 Roof Ventilation Alternatives post here! By installing a ventilator on your roof (with a compliment of air intakes like eave vents, or tiled grills), you’ll be pulling cooler replacement air to flush out the radiated heat in your roof. Less heat on your roof means less warmth radiating down constantly into your home. If you wonder why your house is still warm at night time when the outside is cool, it’s most likely because you have residual warmth in your roof. If you have roof insulation as well, you’ll be preventing heat from leaking down into your roof. However, it is a bit of a double-edged sword! You’ll want a heat extractor that prevents heat from gathering in the first place. Insulation acts like a sponge and will trap heat. So make sure you invest in a ventilator that suits your roof space best. Check out our 2018 round-up for more information! Insulation is an important step in keeping your home either cool in summer or warm in winter. It acts as a thermal retardant and sponge, preventing heat exchange between two mediums (your home interior, and your roof space). By layering your roof space with insulation to prevent heat transfer through your ceiling, you aid in stopping heat leakage that will keep your home warm through the day. Your air conditioner won’t struggle as much to keep the living space cold! Remember, 35% to 25% of heat transfers through the roof. There’s a bit of a double-edged sword too, in that insulation will capture heat. Ensure you’ve got a roof ventilator extracting heat, and you’ll be cooling your home with ease. This, combined with blackout curtains, stops an incredible amount of heat transfer throughout the day. A simple, modest garden can do a world of good for keeping heat away from your home. Here’s one most places won’t tell you about! Your garden is actually a wonderful way to stop heat from entering your home. Concrete acts as a large heat sink. On a hot summer day, you’ll notice how warm any hard surface can be—especially roads. By having a well-tended garden surrounding your home, you can block sunlight from beating onto your walls, and have a natural thermal retarder—soil! 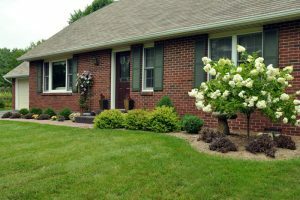 If your home is surrounded by concrete, see what you can do to install some in-ground soil beds around your walls, and maybe throw in a few bushes for good measure! With all these tips in mind, you can start working on cooling your home down through the coming hot seasons! However, we aren’t stopping there. We’ve got a few other tips & tricks to share that you should consider. Double-glazed windows are fantastic at preventing heat from transmitting through into your living space. These can half your heat loss or gains! They can be a little more expensive to install but are well worth it for ensuring your home feels cooler through the winter. See more about glazing at YourHome.gov.au here! NanoShield is a fantastic technology that can be painted onto window surfaces. This coating dries quickly and creates a powerful thermal barrier that can prevent infrared, and ultraviolet light harming or entering your home. This is a relatively simple addition to your windows, and results are very apparent. It acts as yet ANOTHER shield for heat. See more about glazing at NanoShield here! This is pretty much common sense, but it’s surprising how many folks will use a split-system or evaporative air conditioner while leaving doors open around the house. Unoccupied spaces that are closed will ensure that your larger, occupied living space will be cooled quicker. Consider where you put fans for airflow, or where your kitchen is situated. Your fridge is one of the largest items in the house to produce heat, and your air conditioner placement should work to reflect that. If you’ve got stand-up fans that are helping move air around the home, consider how you’re using them to move cool air through the home. See more about heating & cooling at YourHome.gov.au here! Got any further suggestions on how to improve your heat extraction & home cooling? Let us know! Send us some email. Happy home improvement, everyone!